23. A poster to express solidarity with Palestinian political prisoners. 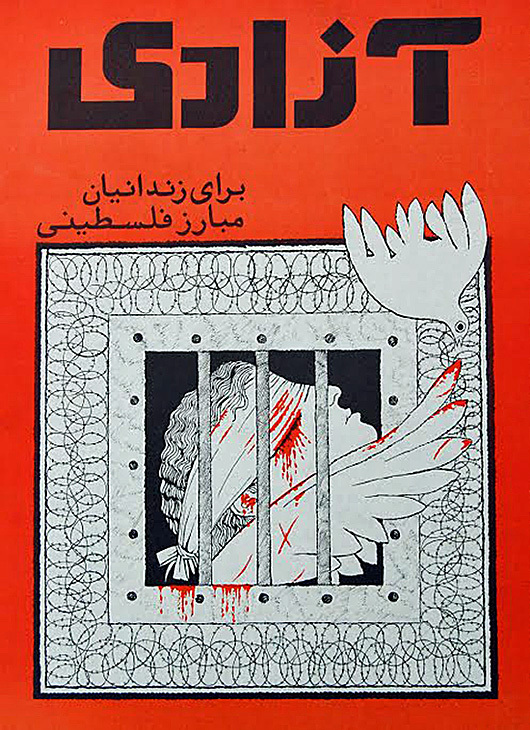 We see a number of quite prominent pro-Palestinian posters in this collection, a clear sign of the centrality of the Palestinian cause to the Iranian revolutionary project in the 1960’s and 1970’s. Almost all these posters are by militant Marxist organizations, a fact that was later categorically appropriated by the militant Islamists for their own post-revolutionary political purposes. This is not to suggest that militant Islamists were not pro-Palestinians. They were. All revolutionary forces were decidedly and purposefully pro-Palestinian. But in the aftermath of the murderous crackdown of militant Marxists by the victorious Islamists, these posters have become a critical historical evidence.